SSCM « The SQL Dude! I recently installed SQL 2008 R2 alongside my existing SQL Server 2012 instance. I wanted to change the service account for the SQL Agent service, so I opened SQL Server Configuration Manager (SSCM). To my surprise, I got this error. Bear in mind, this is a freshly installed OS and SQL combination. Considering this to a WMI error, I recompiled the MOF file –> mofcomp.exe "C:\Program Files (x86)\Microsoft SQL Server\100\Shared\sqlmgmproviderxpsp2up.mof"
I even un-registered and re-registered the sql provider DLL –> regsvr32 "C:\Program Files (x86)\Microsoft SQL Server\100\Shared\sqlmgmprovider.dll"
But the issue was not resolved. This was working before and all I did was to install another instance of SQL 2008 R2 which went fine without any issues. Basically, this was the same error as before. Interestingly, I could connect to the SQL 2012 namespace root\microsoft\sqlserver\computermanagement11, and the query to list the SQL Services worked as well. 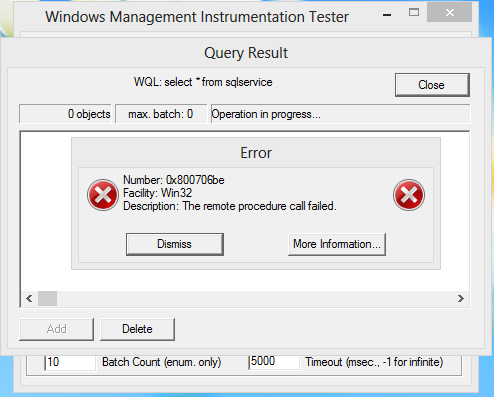 I checked the application event log and found this “Application Error” Event ID 1000. This tells me that the wmiprvse.exe (WMI host process) is crashing due to an issue with svrenumapi100.dll. This is the DLL that SQL Server uses to perform discovery of services. If you have SQL Server 2012 running side-by-side on the same machine with SQL Server 2008/2008 R2, then you need to have SQL Server 2008 SP3 or later (or) SQL Server 2008 R2 SP1 or later. This is required to obtain the edition information when performing a SQL Server discovery across the enterprise. I applied SP2 on my SQL 2008 R2 instance and that fixed the issue with configuration manager. If you run into this issue, this piece of information might help you. If a certificate is provided to SQL Server and for some reason it is not valid or SQL cannot find the certificate in the store, then it generates a self-signed certificate to encrypt communication between the server and the client. This method ensures that the login packet is always encrypted. Whether the data communication is also encrypted depends on both the server and the client. In order for the client to force encryption, the certificate used by the server should be signed by a trusted certificate authority. When loading a certificate on the SQL Server machine, you have to keep in mind what the SQL startup account is. 1. If the SQL Server is running under a specific domain account, then you need to be logged in to the machine as the same domain account and when opening MMC, choose this option to load the Certificates snap-in, before doing the import. This makes sure that the certificate goes into the Personal store of the user who is also the SQL Service account. 2. If the SQL Server is running under any machine account like LocalSystem, NetworkService or LocalService, then you need to choose the option “Computer Account” in the above screenshot and then import the certificate. This will ensure that the certificate is placed under the Personal store of the machine account. Needless to say for doing both of the above, the logged-in account must be an administrator on the machine. 1. SQL Server Configuration Manager (SSCM) – How does it pull up the certificates and why doesn’t it show my valid certificate it the list? I always wanted to find out how SSCM shows the certificate list and why sometimes some certificates even if valid are not shown there. SSCM uses WMI infrastructure to find out the certificates which are valid to be used by SQL Server. Now there are some additional checks done here which is not done by SQLServr.exe when actually loading the certificate on service startup. As you can see above it listed 2 certificates on my machine. Run this from command prompt cscript sqlcerts.vbs and you will see the output as shown below. I see the same 2 certificates shown by SSCM. So now we know that the certificates are shown by pulling the information from the WMI class SecurityCertificate. If you are using using SQL 2005, in the above VBScript, replace ComputerManagement10 with ComputerManagement. If yours is a clustered instance of SQL Server, then the CN in your certificate will contain the FQDN of your virtual server name of the instance and not the node names. SQL Configuration Manager does a direct match between the current machine name and the CN name in the certificate [i.e. certificates that match the machine name are only displayed], which will never match in case of a clustered instance. So you can ignore this and use the registry method to load the certificate. The Server Authentication property or the AT_KEYEXCHANGE property is not set. The Certificate is using Subject Alternate Names (SAN), which is not understood by SSCM. 2. Subject Alternate Names (SAN’s) and whether a certificate having SAN’s can be used by SQL Server. Subject Alternative Names allow you to specify a list of host names to be protected by a single SSL certificate. This is useful when you want to buy 1 single certificate to secure multiple SQL Servers. Cheaper option I guess . But anyways, certificates having SAN names are supported and SQL Server can use it for SSL encryption. 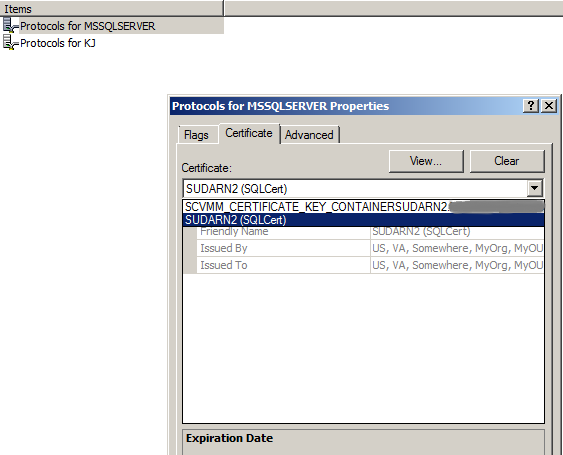 If you provide the thumbprint value in registry, SQL Server will load this certificate. SQL Server doesn’t examine the SAN while choosing a certificate to load. I confess I hadn’t heard about SAN names before, so I tested this by creating a certificate using openssl.exe by having 2 alternate names. You can download openssl.exe for testing purposes from HERE. The alternate names I have used are alternatename1 and alternatename2. Replace this with actual server names as applicable. 2. Once you install the tool, go to the ..\bin\openssl.exe location from command prompt and run the following command to create the certificate. 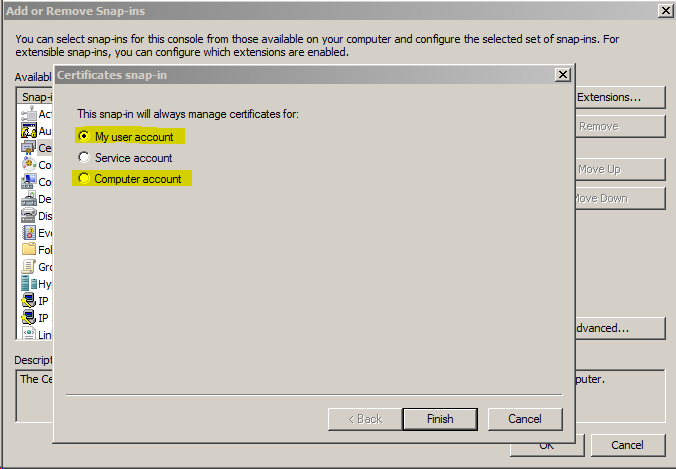 This will create a file called cert.pfx which can be used to install the certificate or imported using the MMC certificates snap-in. Now that you a certificate with 2 alternate names you can see for yourself that SQL Server can load this certificate fine. Again you will see the SQL Config Manager doesn’t show this certificate. Most cases the main CN name will not match the machine name in case of SAN certificates and that’s why SSCM doesn’t show you the certificate. The SAN field in the SSL certificate is not examined by all SQL Server client drivers when they are validating the server certificate. Only fairly recent drivers examine the SAN when validating a certificate, like the following. So, if the client application is using .Net 4.0, for example, and you try to rely on the SAN, the client application will not accept it. Keep this factor in mind when deciding to use SAN certificates or go with individual certificates for each machine. A connection was successfully established with the server, but then an error occurred during the pre-login handshake. I was able to reproduce this issue quite easily. As you can see in the above error message, the reason the connection didn’t go through was because the certificate’s CN Name did not match the SQL Server name. If your SQL Server machine is called “THEMATRIX” and you create a certificate called “MyServerName” and you provide the thumbprint of this certificate directly in the SQL server registry, SQL will load this certificate just fine. Surprised? Have a look at my repro. 1. I created a certificate using openssl.exe with the following properties. 3. SQL Server successfully loaded this on restart of the service. 2012-04-03 02:52:57.100 Server The certificate [Cert Hash(sha1) "A1A3DB2BD029B39FF9329E46B730CF8DF4BE2383"] was successfully loaded for encryption. 4. When I connected from SSMS, I get the same error as reported by my customer. So now read the documentation again and it will make sense. What Books Online is telling you is that for a successful SSL encryption and connection, the subject Name in the certificate has to match the FQDN/Server name. In the above scenario, I deleted the certificate “MyServerName” and created a new certificate with the CN as “TheMatrix” and was able to connect successfully from SSMS. When the above property is set to True, SSL is used to encrypt the channel whilst bypassing walking the certificate chain to validate trust. If TrustServerCertificate is set to true and Encrypt is set to false, the channel is not encrypted. So you need to have "Force Protocol Encryption"=Yes and "Trust Server Certificate"=Yes. I must confess this was a strange issue to encounter and I saw this happening with my own eyes. Every time the SQL instance was failed over, even though the certificate was present on both the nodes, SQL was using a different self-signed certificate when starting up. I initially suspected this to be a cluster registry checkpoint issue, but after making sure that the registry value was correct on both the nodes, still on next failover some new thumbprint was getting loaded and this thumbprint value was also being placed in the registry. There is a thumb-rule you can follow. When in doubt, use Process Monitor. So I did . I collected a process monitor trace without any filters and saw this happening. From the above snippet you can see that wmiprvse.exe (WMI) is setting the value of the certificate to a new value. The thumbprint value is getting changed to a new value from what was there before. On further research, it was identified that this environment had System Center 2012 Configuration Manager installed and these SQL Server nodes were being managed by System Center. My colleague from the System Center team confirmed that there is a component there called “Certificate Manager” that frequently polls all the systems (ones with any roles installed) to check whether the certificate information there matches with what is stored in the System Center database (for consistency reasons). Obviously, since this is a clustered instance of SQL Server, we have edited the registry to provide the certificate value. System Center is not aware of this change, and it thinks that the certificate has been changed and puts in a request to generate a new self-signed certificate and updates the registry with the thumbprint of the new certificate. This was what was happening here. I am told System Center 2012 Service Pack 1 will have a fix for this problem. If you want confirmation, contact System Center MS Support. There are many reasons for this, which you need to find out from the SQL Error log. One common problem that can happen when inputting the thumbprint into the registry when you Ctrl+C the value and paste it into the registry, some extra spaces/junk/invisible characters get copied over if you copy this from MMC. Have a look at the following KB article. 2010-04-16 18:56:31.48 Server Error: 17182, Severity: 16, State: 1. This is definitely outside the realms of SQL Server. 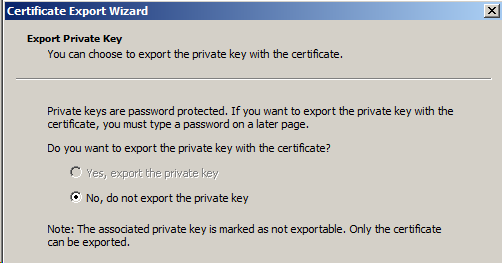 When you try to export the certificate you get to the screen where you have to choose the option to export the Private Key of the certificate, but the option is greyed out as shown below. The reason the option to export the private key is greyed out is because the certificate was created without the option to export keys. There is an option during certificate creation for Server Authentication to “Mark Keys as exportable”, and you should choose this option. If you don’t, you can still export the certificate and install it on another node, but it won’t have the private key and without the private key SQL Server will not be able to load the certificate and hence cannot start. Well folks, I’ve covered a lot of topics here. Believe me if you can follow these steps, I’m pretty confident you should have any issues before, during and after configuring SQL Server for SSL encryption. If you do happen to run into any issues, please drop in a comment on this post and I will respond back to this. Cheers!